Kiah..you look AMAZING ma! That dress looks great on you. I'm lovin' the stripes, color and fit! Ohhhhhh..and that veil headband....FAN-TA-BU-LOUS!! I love your lady dress Kiah!!!!! 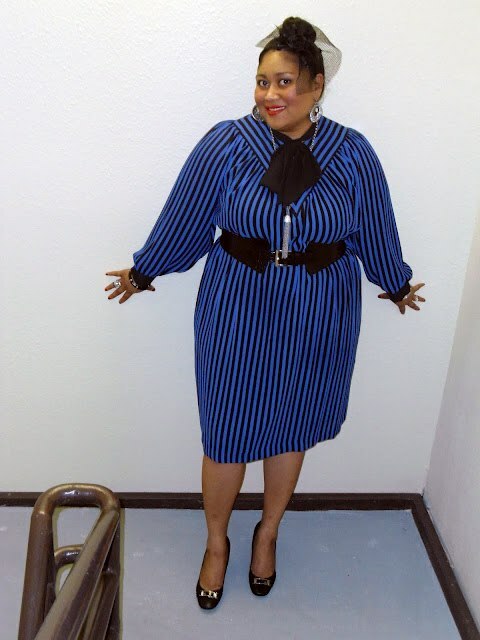 You totally rock black and blue stripes and the veiled hat! Ah-may-zing! I love this so much. You look beautiful in blue. The whole outfit is absolutely the best. I love this look? How do I get to be as fashionable as you? girl you always do good. and you work it real well! I like this one girl...i need a thrifting guide for dummies...seriously. where do you find your stuff? wow, Kiah! This outfit is supreme! You look absolutely amazing such a unique look too! I love the color scheme, its def. something I want to try! GIMME THAT DRESS!!!!!! I absolutely love this look! Love this Diva ! you are fab .. following ! Many do you know how to accessorize! Love the look!! By the way, I'm giving away a pair of heel condoms so you should check them out! Just in case you don't know what they are.. they are an amazing accessory to spice up any heel. Go to www.l0velindsey.com to check them out and enter. Oh Kiah! I love this look! That dress looks marvelous with all the accessories you've worn with it, especially that gorgeous hairpiece! You look so chic here. I love your hat. Congratulations on your anniversary date night with your boo. You guys looked so cute. Love the purple satin dress, so glamourous! Love my soulfood!!! !